Obituary – Whitney, Muriel Jo (Lavington) « Perry High School Alumni Association, Inc.
Glee Club ’20, Normal Training, P.H.S.C.A., Triangle Club. Rites have tentatively been set for 1O a.m. Friday in Del City for Mrs. Brady Whitney, 69, formerly of Perry, who died Tuesday at her home in Oklahoma City of a heart attack. The service will be under direction of Bill Eisenhour funeral home, Del City. 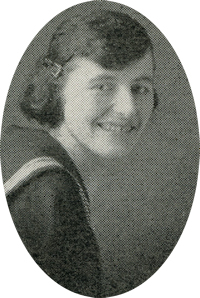 Mrs. Whitney was the former Muriel Lavington, daughter of the late Mr. and Mrs. Robert Lavington of Perry. She was graduated from Perry high school and attended Central State university, Edmond and the University of Oklahoma, Norman. She had been a teacher in several Noble county schools. Among survivors are her husband of the home; two daughters, Mrs. Allan E. (Phyllis) Price, Del City and Mrs. Frank (Maxine) Moss, Shreveport, La. ; three sisters, Mrs. W. G. Foster and Miss Rose Lavington, both of Perry and Miss Amelia Lavington, Oklahoma City; four grandchil­dren, Jerry, Larry and Jean Price and Alvin Moss; and one niece, Mrs. Gary Perkins, Tonkawa.